Brewster's post is spot on correct. If you look up her old posts, you will see her giving people negative advice and uninformed opinions in reference to the Heights. A neighborhood that has changed so much since I moved up here 17 years ago it is unrecognizable. Of course, anyone should be aware of their surroundings. Jerseymom has been making negative comments about the heights for years. You'll always see her posting crimes up here but never in her neighborhood and giving people advice on the area when she no longer lives up here. Some people just have issues. I didn't take it as though you were cautioning against bogeymen, rather responding directly to my question as to whether to the stop was isolated at night. This is a little over the top. JerseyMom has always been one of the most courteous and helpful people around here. Her posts are usually very helpful or very much on point. A difference of opinion does not make one a person with issues. I hear you, but I don't find it unsound advice for anywhere in the urban NY metro area. To many people wander around "witless" buried in their phones, both eyes and ears. Like any predator in the wild, our urban predators look for those who display weakness by not paying attention. And those predators go where the prey is, whether that's Downtown or wherever. I've used the elevator many times at night. It's safe. Hope this helps! Just keep your wits about you in the area and you'll be fine. 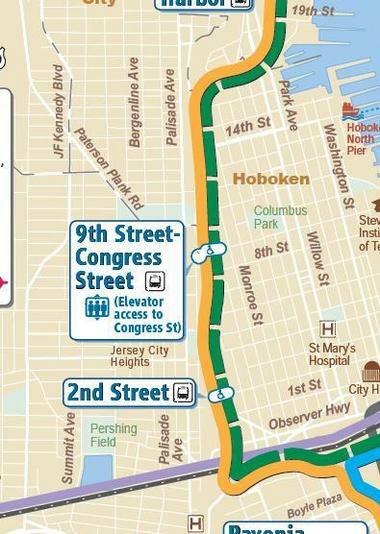 This stop is in Hoboken not JC right? How close to Washington Blvd? Is it crowded-safe at night or in a remote location? Weekend hours?